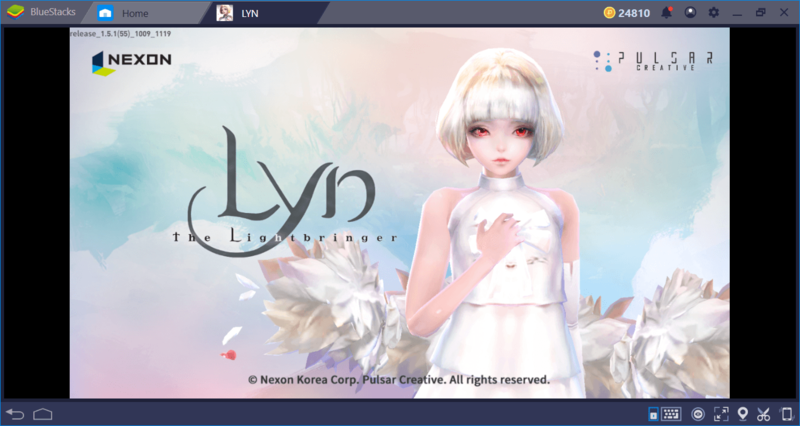 LYN: The Lightbringer is the result of a collaboration between Nexon and Jeong Juno, a famous manga artist in Korea. Mr. Juno’s illustrations are pretty unique and beautiful – the game has a very sophisticated look right from the start. 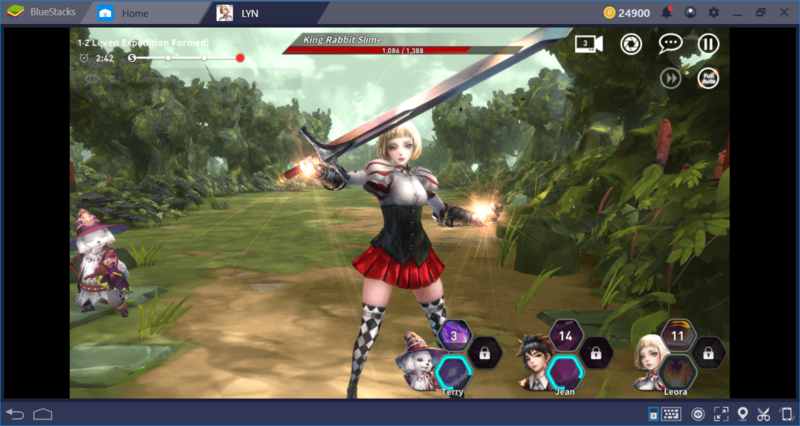 As it is usually the case, we are trying to save the world from an ancient evil by trying to form up a team of heroes: LYN: The Lightbringer contains light gacha mechanics and combines them with real-time, side-scrolling combat. 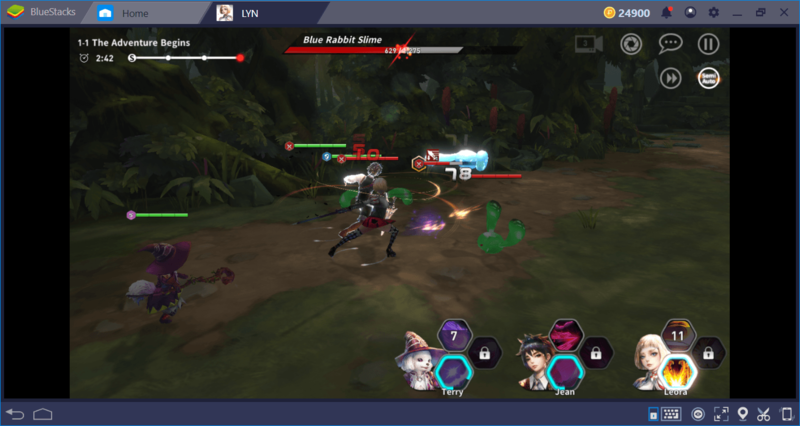 Let’s take a closer look at the game on BlueStacks and find out what it truly offers, shall we? You start the game with a team of three heroes and your first goal is to clear a forest from…. Well, cute but deadly bunnies. As the story progresses, your enemies become stronger – just like your characters. Speaking of story, the game tells you about it during the download process and we highly suggest you watch it. Knowing what is happening in this world gives you an immersive experience and you feel more connected to the characters. After completing three tutorial missions, the game really starts. The main screen is clear and easily understandable, and offers you three game modes: Challenge, Adventure, and Match. Adventure: This is the main story tasks. There are 9 chapters and each chapter consists of 10 missions, so you can complete 90 tasks in total. Challenge: Multiplayer raids, which you can complete with other players. 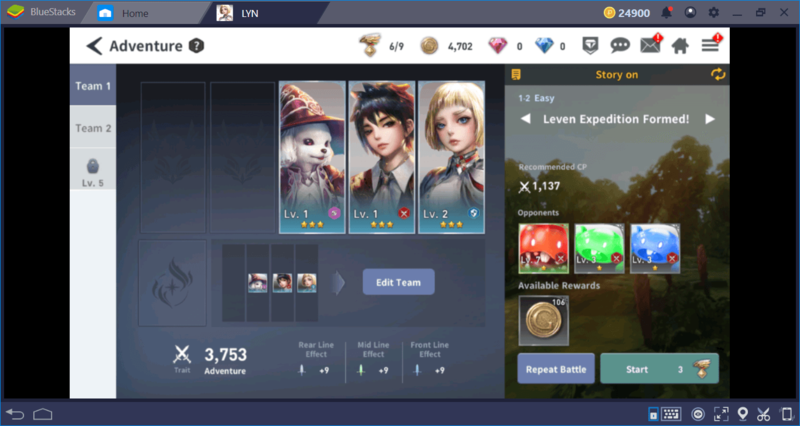 You can start joining these raids after clearing the 1-10 adventure mission. Match: The PvP part of the game, you get to fight against other players’ teams in an arena. Each hero belongs to a class archetype, such as a tank, healer, and damage dealer. Completing adventure and challenge missions will award XP points, which you can use to increase their levels. You can also “develop” and “enhance” them by using materials and low-level characters, to further empower your heroes. 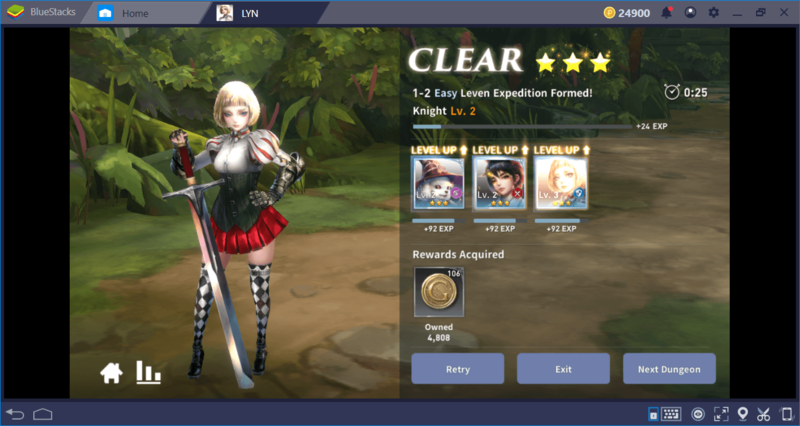 Lastly, you can “evolve” them and increase their star levels – in theory, you can turn a 3-star hero into a 5-star one. However, this will require lots of materials and too much time, so your goal should be forming a natural 5-star hero team by making summons. The combat system resembles Epic Seven – in fact, it is almost an exact copy. After starting a mission, your heroes start to run on the map and automatically fight enemies along their path: You cannot control this part. What you can do is to decide when to activate normal and ultimate skills of your heroes. Simply put, you are a “button pusher”. Each hero can bring three skills to the battle. They can be seen next to the portrait of the characters. The ones on the top are “normal” skills, which you can use whenever they come out of CD (cooldown). The one at the bottom is the “ultimate” skill, which requires a long time to charge. Most of the times, you will be using it only once during the entire mission. You can change the camera angle and watch the battle from different perspectives. 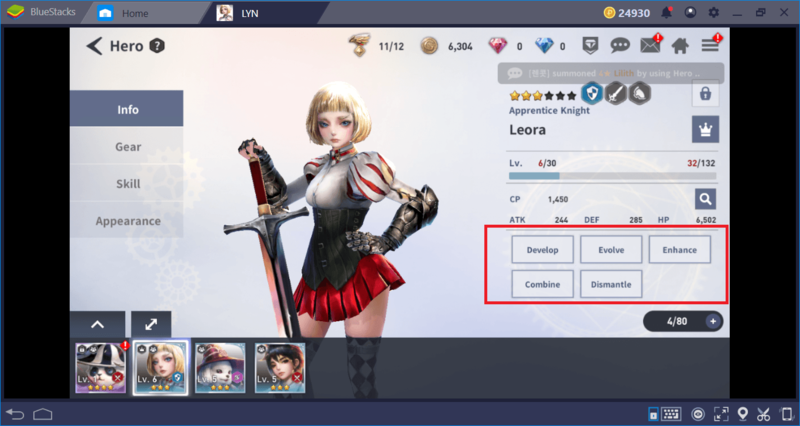 The skills of your heroes can also be “chained” and made more powerful – take a look at our BlueStacks guide to learn how you can use this with Combo Key feature. To summarize; form up a team of most powerful heroes by summoning them, empower your characters by completing tasks and using materials, and lastly, face the ancient evil once again to save the world – the good old formula of gacha RPGs. 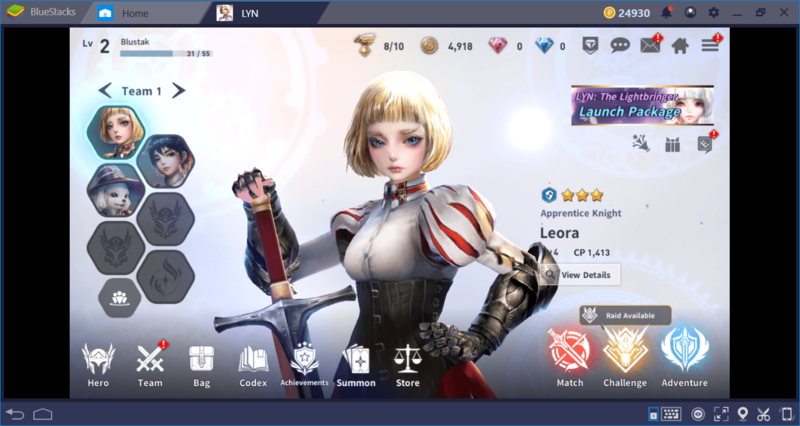 LYN: The Lightbringer offers nothing new but it allows you to get access to some of the features right from the start (such as raids) and contains probably the most impressive visuals we have ever seen in a gacha game. You should definitely give it a go, especially if you have finished Epic Seven and are looking for a similar game to play. See you in the game and good luck!